We hope your year is going well so far and that you’ve enjoyed reading our recent articles. We’ll have exciting news to share in the coming months, but in the meantime, we wanted to let our readers know about an update to our site, publications and outlets we’re now contributing to, and recognition we have recently received for our work. We have decided to eliminate the charge for Premium Members. We still have Premium Membership, which provides access to the archives as well as our newsletter, but now it is free, so be sure to sign up at this link. And, if you’re concerned about privacy, we never sell or share your email with anyone. The only reason we wish to have it is for the occasional and rare special announcement. If you are already a Premium Member and have signed up for auto renewal, there should be no need to make any changes as it should auto renew with no fee involved. However, during the transition process, several memberships did not transfer over, so please check your status and if that happened to your account, you can sign up again at no charge. It was one year ago we started writing for U.S. News and World Report as a biweekly contributor to their Travel Section. Many of these stories have also been picked-up by Yahoo!, MSN, and Business Insider. We often post articles on a similar topic on PratesiLiving.com, but on our site we provide significant photo and video coverage for the story as well as enhanced stories and content. Lastly, our travel pieces have recently been published in World Travel Magazine and Atlanta Homes & Lifestyles. While we continue to write about culinary travel, the past two years have been more focused on travel destinations. We became a member of the North American Travel Journalists (NATJA) and have been honored to receive a number of awards from this prestigious organization in both 2015 and 2016 in their Travel Journalism Awards. 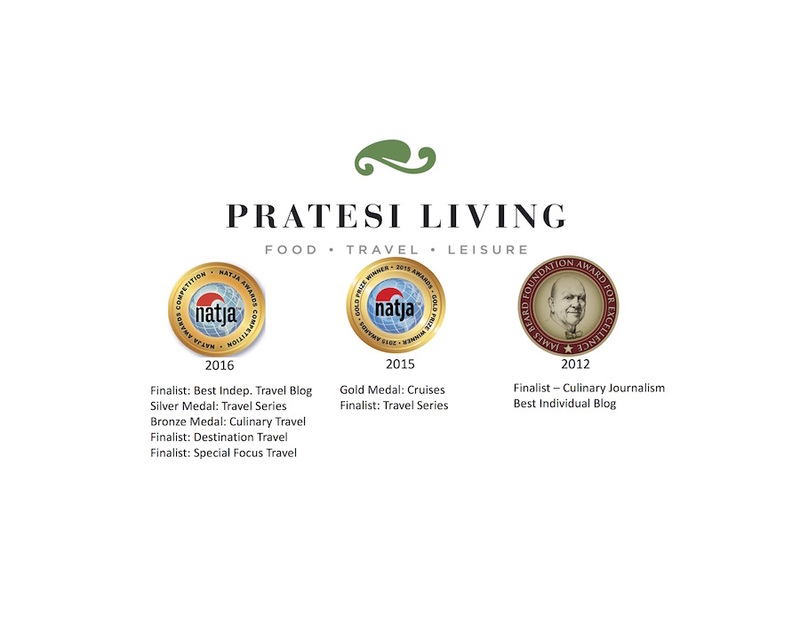 In 2016, Pratesi Living was a finalist for Best Independent Travel Blog as well as being recognized for articles in these categories: Travel Series, Culinary Travel, Destination Travel, and Special Focus Travel. These articles were from our travels to Ireland, Virginia, Nevis in the West Indies, and a cruise through Portugal, Spain, and France. We hope you’ll take time to read a few of them. We have visited many fascinating places over the last year, so stay tuned for pieces on these exciting destinations: Asheville, NC; Nantucket, MA; the Caribbean; the Azores; the Rhône River region in France; and Central Germany. Our upcoming travel plans include more interesting trips in the near future, that we also look forward to sharing with you. If you want to follow along on our journeys, please follow us on Facebook, Instagram, and Twitter. As always, if you have any questions about places you’re interested in visiting or trips we’ve taken, we’d be happy to answer your questions. You can send us a message via the Contact form on this site. Thank you for your continued support of Pratesi Living!